Generally, anime is often filed into that category of “if it looks bad, just leave it be” since there are more productive things to do with free time such as isolating myself from the rest of society as I build Gundam models or go hiking in the woods. However, there is a rare bird that flies through the window that makes me bloodthirsty to watch and write about how awful the series is. Unfortunately, the amount of times I’ve ventured into an anime I was sure I would hate, only to backfire on me, is far higher than I’d care to admit. A notable time this occurred was when the show Saga of Tanya the Evil came out- I went into it ready to knock the art style and how ridiculous the concept was, only to admit publicly that not only was I wrong about the series, but that I rather enjoyed it. With the past year of anime viewing being in odd, two to three week bursts of twenty-something episode binges (hey, when you get a rare chance to watch something, you gotta take it- I’m doing that kind of binge with films as I’m writing this), there are plenty of series I ended up watching without any particularly strong opinions about. One, however, has baffled me for a while since I really didn’t know how I felt about it until recently. 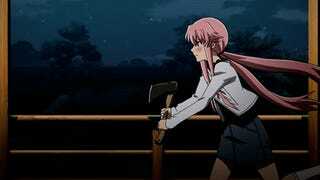 The polarizing series The Future Diary left itself as equal parts scarring and entertaining as it is awful and funny. The series was originally written and illustrated by Sakae Esuno, who might be one of my least favorites in the business- I’ve notably gone toe to toe with another one the man’s creations, Big Order, in what I can only call a heavily edited review. Needless to say, I went into The Future Diary ready to tear into what I was assuming would be utter garbage. After my first sit down (about thirteen episodes), I left with mixed feelings. The second sit down, the second half of the series, really mad me unsure of myself. Hard pressed, I would probably say “I...liked...it...?” in a confused voice. The things that pop out as “good” right off the bat carry this show- it has a ton of characters that are genuinely interesting and despite being a battle royale series, it is interesting to see what leads to these strangers getting their supernatural “diaries” that give them absurd abilities. This is thrown in with comedy that I can only call an acquired taste. 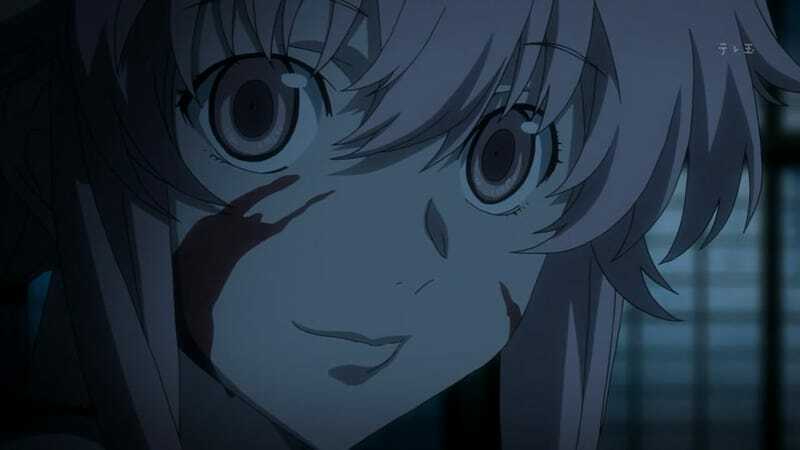 The most famous example that shouldn’t be a spoiler to anyone who has seen anything related to the series is how one of the main characters, Yuno, is a complete yandere. I’m not saying much else besides that (if you’ve seen what sort of things having a yandere like her in it has done, good on you, otherwise...maybe that is good thing for your health), but this defining characteristic of the character is bludgeoned into the audience worse than that time Ryan Gosling crushed a man’s skull in an elevator (YouTube that at your own risk). The story is held together by the fact this young lady is a yandere, and whether you find that to be the funniest thing or lackluster ultimately will decide how you enjoy the ride. What makes this more interesting is how the same humor can easily be applied to all of Esuno’s work, but compared to the other times, it just works here. There are plenty of other characteristics that are dashed in with the surprisingly competent storytelling that surrender this show into becoming an over-the-top action comedy series. The expression “it is so bad that it is good” is perfect for this kind of show; yes, a lot of the story becomes clouded and messy because the fact that every situation turns into a punchline a small pink hair girl comes flying down a hallway with an axe or a purple haired woman in an eyepatch detonates explosives in what feels like an expected routine. What ends up happening from all of this is The Future Diary puts all of its chips into the center of the table on a bet. It wants to either be loved or hated, and it doesn’t care how loud it has to be to get there. To have the guts to make this kind of decision, I have to tip my cap to the series. There is some horrible, horrible stuff in this show. It really misses the mark at times, and yet the same volume shooting that puts it into that hole is immediately reversed by some entertaining high notes. So when I say I was mostly wrong, it means that I wasn’t expecting it to reach the heights it does at times. I still use screenshots from the show to send to friends and most of the conversations I have about it end up with me smiling and recounting some silly decision the show decided to do. As jaded as I can be and as much as I’d like to just trash on this series because of who created it, I was wrong to think that it was nothing but a bad time. Oh and the first opening theme song is an absolute banger. What’s a series that you really wanted to hate but ended up enjoying? Let me know in the comments. Have a wonderful day, and enjoy the rest of the summer!